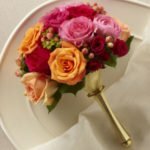 From Biedermeier bouquets to wreaths, Albuquerque Floral’s Wedding Flower Glossary will help you get up to speed on some of the common wedding flower terms. Biedermeier – A bouquet with several different blooms wired in circular rows. 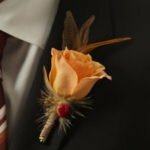 Boutonniere – One or more buds with a short, wrapped stem and attached by a pin to the lapel. These are typically worn by male participants in a wedding. Candelabra – A floral arrangement attached to the base, neck, or top of a candle holder. They usually include elements such as greenery or ribbon to match the style of the wedding. Cascade – A long bouquet arranged to flow over a bride’s hands. 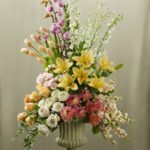 Classic Bouquet – A tight bundle of flowers. 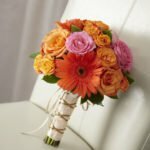 They can be fastened to a bouquet holder, wired together, or hand-tied. Composite – One flower made up of many different petals and buds wired together. This creates the illusion of a single, large bloom. Crescent – One full bloom and other stemmed flowers wired together to create a handle. A full crescent design has one flower in the middle and other blooms emerging from the sides. A partial crescent has a center flower, but the blooms trail out of one side only. Corsage – A small arrangement with a single flower or small array of flowers. Corsages can be pinned on, attached to the wrist or held by hand. For weddings, mothers and grandmothers traditionally wear corsages. Dais (also Altar Arrangement) – A floral arrangement centered on a low table in front of the bride and groom during the wedding ceremony. They can hang over the lip of the table or stand in a vase. Garland – A long, woven arrangement of flowers used to decorate pews and doorways. Children sometimes carry them down the aisle. 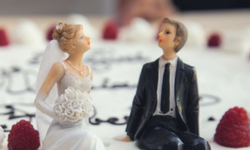 Huppah (also chuppah) – A canopy decorated with flowers. Ikebana – a Japanese-style art form which incorporates the union of nature and flowers. Nosegays – Small, rounded bouquets made up of bundled flowers and greenery. These bouquets are either tied or wired together. Posies – A bouquet like a nosegay, but smaller which makes it easier to hold. 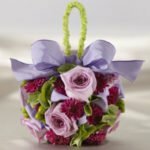 It can contain ribbons or silk flowers. 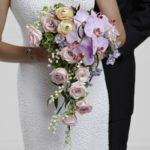 Presentation – A bundle of long-stemmed flowers which held in a bride’s arms. It is also known as the pageant bouquet. Taped and Wired – A type of floral arranging where a flower bloom is secured to a wire with floral tape. Taped and wired flowers are easy to shape and are popular for bouquets and boutonnieres. Tussy Mussy – A small, metallic, hand-held vase which carries a posy or nosegay bouquet. The origins of this cone-shaped holder stem from the Victorian era. Topiary – Flowers, trees, or bushes trimmed into decorative shapes. A plant sculpture. Trellis – A latticework frame used as a support for vining plants and flowers. Wreath – A ring of flowers and greenery used as a headpiece, centerpiece, or door decoration.